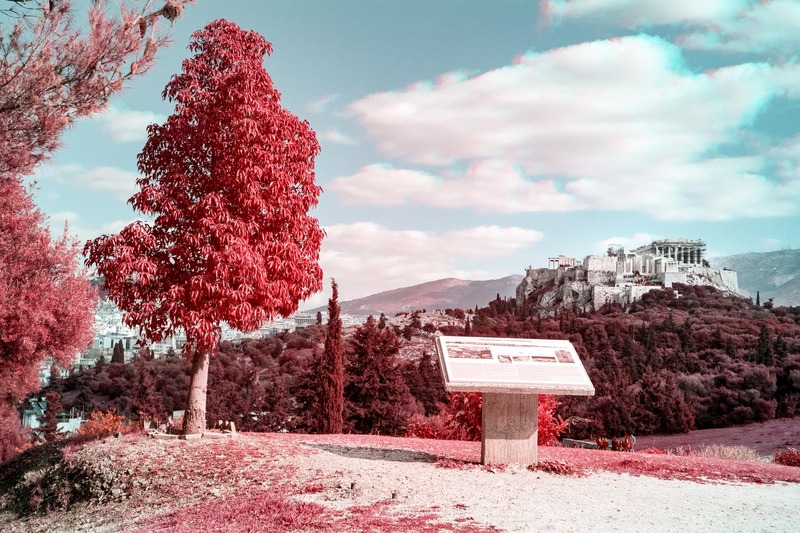 A colour infrared photo of a scene at the Pnyx with the Athenian Acropolis in the background. The photo has been created using the trichrome process. The trichrome process was the first technique used to create colour photographs more than one hundred years ago. It is an extremely difficult technique in the darkroom as it involves the perfect alignment of three consecutive black and white negatives on a single piece of paper. The advent of colour film made it obsolete until the modern digital era. Using image manipulation software it is easier to make a trichrome photo, although it is still rather pointless and it is only done as a small project by anyone who tries it. This photo could also be taken using an infrared converted camera with a yellow filter attached to the lens -the same process used with the Kodak Ektachrome EIR film. After reading about the mundane technical stuff of how that film worked, I thought that I could make a similar image using the trichrome process by combining the appropriate channels of an infrared and a regular photo in Photoshop. The initial tests I did a couple of years ago were not successful but the idea was stuck in the back of my head until now. Since I can take infrared photos with this camera I thought that I can make a shot with an infrared filter attached and immediately take it out and make a normal shot without moving the camera and wasting time. Of course, since the shots are taken in different times, some movement in the scene is inevitable, which is translated mainly as the cyan and red patches in the clouds, but they are not really distracting so I didn’t deal with them. All in all, the digital infrared trichrome is a success and it is a technique I will use more in the near future.